The 6D ATR-2 We didn’t just improve the helmet, we reinvented it. The ATR-2 with advanced ODS is evolved to provide improved performance in both linear and angular acceleration mitigation, and is also easily rebuildable for a potentially longer service life. This improves rider safety and saves the consumer money. The new ATR-2 with advanced ODS provides substantial improvements in performance over the current ATR-1 across the entire range of energy demands; low, mid, and high velocity accelerations for both linear and angular accelerations. The new ATR-2 with advanced ODS provides substantial improvements in performance over the current ATR-1 across the entire range of energy demands; low, mid, and high velocity accelerations for both linear and angular accelerations. Click on the diagram below to see the differences. 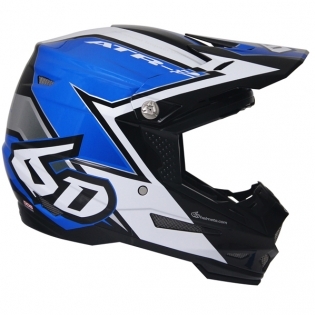 6D’s revolutionary patented Omni-Directional Suspension (ODS) technology represents a fully active, in-helmet suspension and kinetic energy management system. Engineered to uncouple the helmet’s exterior shell from the inner EPS liner, the system effectively mitigates energy transfer to the head and brain of the rider during any given accident or impact event. The ODS system is comprised of 2 EPS liners separated by an array of elastomeric isolation dampers that allow the system to sheer and displace 3-dimensionally when subjected to impact. 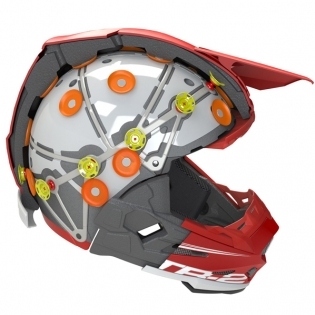 Omni-Directional Suspension functions over a much broader range of energy demands, including LOW, MID and HIGH-Velocity impacts for both Angular and Linear accelerations when compared to other competing helmets, and helmet technologies. There is simply no other helmet, or helmet technology that can provide the exceptional energy management benefits of Omni-Directional Suspension. The Most Compliant Energy Management Solution Available. From low to high velocity impacts the ATR-2 out-performs the market competitors by significant margins. The advanced ODS system is freer to manage shearing loads while managing linear compressions with a combination of isolation dampers and variable height EPP damping towers. Low Velocity Impacts are Far and Away the Most Common Type of Off-Road Accidents. Medical research has provided alarming conclusions surrounding the causes, severity, and long-term effects of concussions. Even seemingly minor concussions may have much more serious long-term effects on the brain. 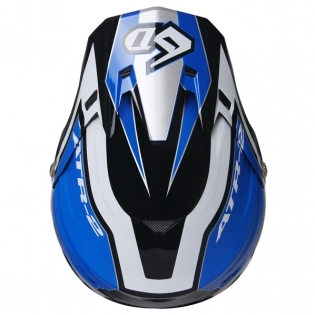 No other helmet company cared about low-threshold energy transfer before 6D brought the issue to light in 2013. 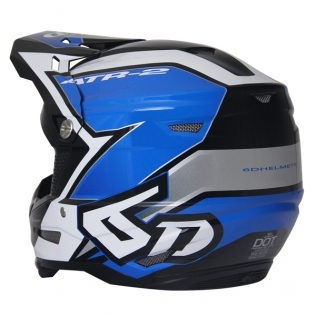 This is the most critical performance range of helmets and covers all impact velocities below the certification standard’s requirements, for both linear and angular accelerations. Low-Threshold Energy is the most concerning problem facing the athlete today, illustrated in this simple graph to the right. As you can see, the energy transfer in all the competitive helmets referenced is at, or above the concussion threshold for an adult male and accurately represents the market. 6D’s Omni-Directional Suspension (ODS) starts working the instant any force is applied to the shell. Its suspended inner liner travels and shears under crash impact loading thereby reducing energy transfer to the brain. Time is Critical in Reducing Energy Transfer to the Brain. Time-To-Peak (TTP) is the measurement of time (in milliseconds) it takes the energy of an impact to reach maximum (peak) G force. Deceleration time is the single most beneficial component of reducing the severity and magnitude of any impact. The more time, the less severe the energy transfer will become. 6D’s advanced ODS technology buys time. Angular Acceleration Force is the Primary Cause of Concussion. Angular acceleration (rotational force) is generated from oblique angle impacts to the helmet surface resulting in shearing, stretching, and tearing, of the soft tissues within the brain. The medical community has determined that angular acceleration is the primary cause of concussion, traumatic brain injury and worse. Laboratory testing at Wayne State University* has proven that a helmeted head sustained the same degree of angular acceleration as the un-helmeted head when subjected to identical impacts. This is because the helmet is directly “coupled” to the wearer’s head. One of the major benefit features of Omni-Directional Suspension (ODS) is that it effectively “uncouples” that relationship allowing the shell and outer liner to shear independently to the inner layer and the head-form; thereby scrubbing off a high percentage of the angular acceleration force. The exceptional test results represented on this website are the actual test data generated from hours of testing the 6D helmet against current model Snell, ECE and DOT certified helmets in a fully-independent, third party laboratory testing facility; Dynamic Research, located in Torrance, California is a recognized as a leader in helmet testing and evaluation and is a pioneer in measuring and evaluating Angular Acceleration. This testing confirms that Omni-Directional Suspension (ODS) significantly reduces energy transfer to the head and brain during crash impact.